The powerful Gods, monsters and myths of Ancient Greek legends give this feature-filled and immensely popular online Slot a truly epic setting. The mighty forces of Zeus, Athena, Poseidon and Hercules all make appearances on the reels of this Slot to guide us mortals along the path of our own fates and fortunes, while one other titanic figure – that of the ever-growing Progressive Jackpot – looms over every spin of the reels. You've heard the names of this ancient Gods before, but now you can come face-to-face with the powerful deities of history's most infamous pantheon. Your destiny sites in the lap of the Gods as you take a voyage into the unknown, attempting to conquer the foes of myth and legend. Fortune favors the brave in this video Slots game. It's no wonder that Age of the Gods™ is one of the most popular Slot games available at PokerStars Casino. Spin your way to the summit of Mount Olympus and there at the apex you will meet Zeus, Medusa and innumerable other mythical figures who have battled the heroes of Grecian legend. This time, that hero is you – take on the role of countless brave explorers who came before you, with the goal not of honor and glory but a Progressive Jackpot prize that King Midas himself would envy. Like battling the Hydra or taking on the fearsome Titans, playing Age of the Gods™ is thrilling. Unlike those adrenaline-fueled fights to the death, playing Age of the Gods™ is simple! The snarling face of the Gorgon Medusa, her head crowned with deadly snakes, guards the doors of an ancient temple. Once you're past her, though, the action begins immediately. 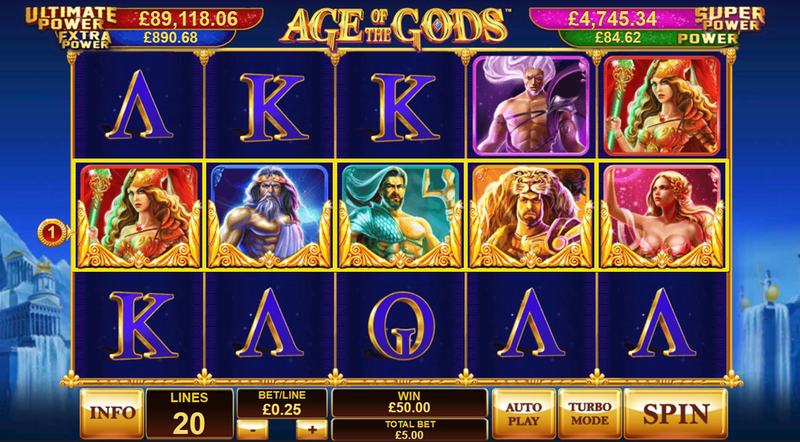 Age of the Gods™ is a five-reel, 20-payline Slot – but if you want to go beyond that and get a piece of that Progressive Jackpot then you'll have to contend with Zeus, Athena, Poseidon and Hercules first! The large, intuitive controls and clear, distinct visuals mean that you always know what is going on in the game at any point – so you can clear your head and focus on your strategy, hoping to hit a bonus feature. The main feature, of course, is the Age of the Gods™ Progressive Jackpot. This is unlocked when you land a sequence of three or more Gods symbols on the reels, and once you enter the Progressive Jackpot mini-game you're guaranteed a win. In the game you'll be presented with 20 face-down coins, which you must turn over one at a time to reveal a symbol: Power, Extra Power, Super Power and Ultimate Power. Match three and that's the size of the jackpot you've won. You don't need to be a high roller to have a shot at striking the Progressive Jackpot prize, though – fortune favors the brave, not the rich, and any spin at any stake can trigger the jackpot. Even a losing spin can take you to the Progressive Jackpot mini-game! Even if you're not one of the chosen few destined to bag a Progressive Jackpot prize, there are plenty of other reasons to get excited about the riches and glory you may find on your Age of the Gods™ journey. The Age of the Gods™ Free Games feature brings you face-to-face with the Gods themselves. Once triggered, you have to pick from a series of icons (similar to the Progressive Jackpot game) until you find three matching Zeus, Athena, Poseidon or Hercules symbols. Match three Athena symbols to play Athena Free Games, where the goddess will grant you a random win multiplier between x2 and x5. As the Age of the Gods™ Free Games feature you will receive is effectively random, this means that online Slots fans will be happy to make regular returns to this game. Each different bonus feature comes with unique perks and animations (like Poseidon firing lightning into the reels for extra wilds) which stops things from getting too boring. On top of that, there is always the chance that you can take a trip to the Pantheon of Power. To journey there, you must land all five God symbols in any order on an active payline. This will trigger a bonus of up to 200x your line bet. The Return to Player (RTP) of Age of the Gods™ is 95.02%, while the maximum win from a single spin in the base game is 250,000 coins. Overall Opinions: Who Should Play the Age of the Gods™ Slot Machine? Age of the Gods™ at PokerStars Casino is, like the rolling hills and wine-dark seas of Ancient Greece, well worth exploring. Not only does it boast some of the best graphics and visual animations of any Progressive Jackpot Slot, but the numerous bonus features and multi-level jackpot rounds are sure to appeal to all fans of Slots games. Win condition (how to win the Progressive Jackpot): Entering the jackpot game guarantees a win. Match 3 jackpot symbols of the corresponding Jackpot or wait for the timer to run out. 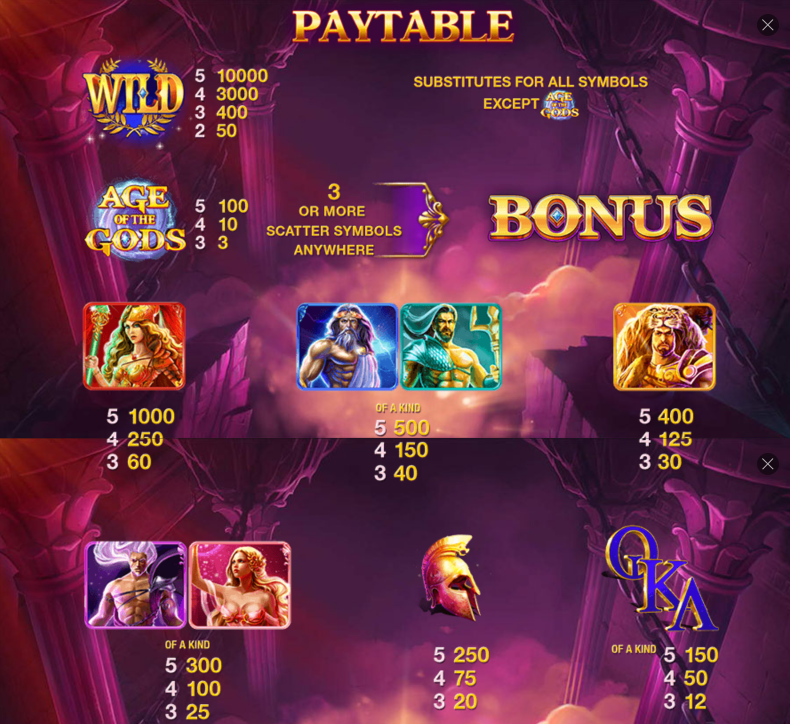 Win requirements (how to be eligible to win): Play a game linked to the Age of the Gods™ Progressive Jackpot.